Earn money with your website – become an official Eiretyres.com partner! Do you run a website about cars, tyres or rims with heavy traffic? Would you like to earn money with your website? 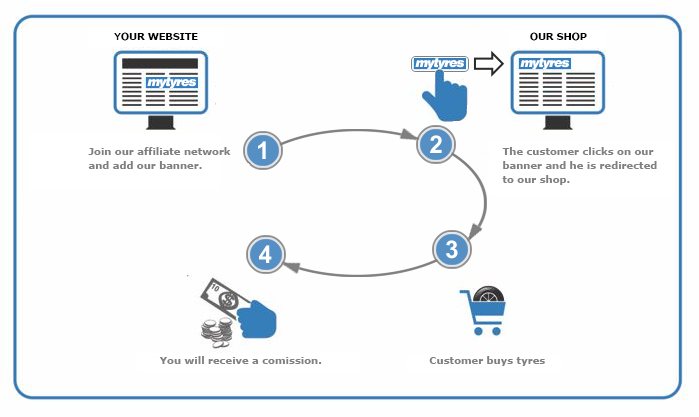 The Eiretyres.com Affiliate Programme makes it easy! Apply now for our Affiliate Programme via the Affiliate Marketing Network Tradedoubler or Affiliate Window and collect your first provisions as soon as tomorrow! Applying and participating to our Affiliate Programme is free of charge. The Eiretyres.com Affiliate Programme is right up your street. We offer you a multitude of advertising materials, which you can easily integrate on your website. Our portfolio of advertising materials includes all usual items, such as banners, text links and tyre search boxes (also available in a white label version). There is something for every website! We also recommend integrating our advertising materials into your Newsletters to further improve your provisions. Should a visitor to your website click on the integrated Eiretyres advertisement, the visitor will be forwarded to the MyTyres Shop. You receive an attractive provision of 3% on any purchases made in our online shop by a customer visiting from your website. (The provision is calculated from the net order value, without VAT and shipping/packaging). Should a customer buy four wheels incl. tyres, their shopping basket can easily reach over 800 GBP. After subtracting shipping and VAT, your revenue for this sale will be about 20 GBP.